In a previous post about iconic Brisbane architect Richard Gailey, I thought out loud that if you wanted an occupation by which you could leave your mark on the world then architecture would be it. When I first started to prepare this post I had exactly the same thought. Richard Gailey and the equally famous Robin Dods were prominent in their time and more prominent thereafter. Today we are looking at the work of James Birrell, also prolific and who in his major projects was just as prominent. We have previously examined a couple of Birrell creations - the Centenary Pool and the Wickham Terrace car park. Like those two public amenities, today's subject is another building Birrell created for his employer. 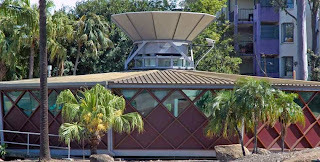 It is the BCC library building at Toowong. My early impression of this twelve-sided building was formed by glimpses as I passed by in a train or a car. A teenager at the time, I likened it to an alien space ship of the type frequently seen in the sci-fi serials of Saturday matinees at my local cinema. It was also reminiscent of the Hoover vaccuum cleaner in the movie "Our Man in Havana" that was around at the time. I mean no disrespect to Birrell (who probably couldn't care less about the ravings of an impressionable youth anyway) - I genuinely admired the building because of these unusual comparisons. Here is a sketch of the building followed by a photograph of it under construction. The third image is from about the time the library was opened in April 1961. There was controversy about Birrell's design from the outset. In fact he had to defend his work against the City Librarian who claimed that a normal rectangular shape would provide more shelf space than Birrell's circular interior. Birrell agreed that this was correct, but pointedly reminded people that shelf space was not the only criterion for designing a library - natural lighting and ventilation were also critical. In any case the building went ahead in accordance with his design. James Birrell graduated from the University of Melbourne in 1951 and was was the chief architect for Brisbane City Council from 1955 to 1961 and during that time was responsible for more than 150 projects - unfortunately many of those have now been lost or redeveloped. 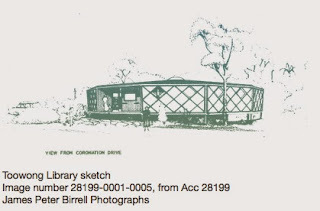 After leaving BCC Birrell went on to work at the University of Queensland then James Cook University and in 1964 he completed a biography of the famous architect Walter Burley Griffin. He also worked in Papua New Guinea for a time before moving to private practice. In 2005 Birrell was awarded the prestigious RAIA Gold Medal, Australia's greatest architecture prize. During the 1960s, following Birrell's' departure from the Council, alterations were made to the library including the replacement of the light troughs and suspended lighting features. 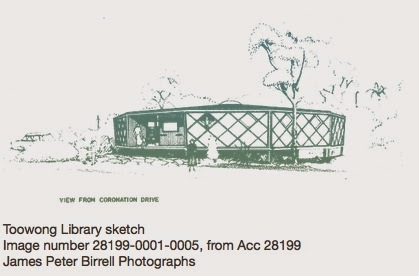 The library was threatened for closure in 1982 following the opening of a new municipal library at Indooroopilly in 1981. 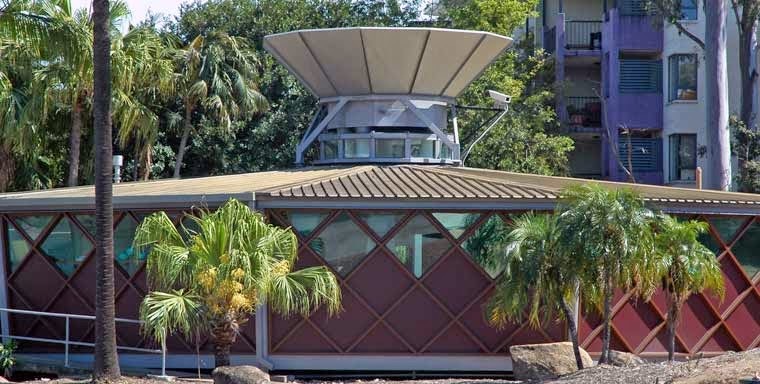 The Toowong Library did in fact close but local residents' action saw it re-opened in 1983. Alterations were made to the building in 1983 when one of the rooms on the lower floor was acquired for use by the local councillor as a ward office. This room which was originally planned as an auditorium was used by the library as a workroom and to accommodate the councillor was partitioned to form a reception, office and storage space. Here is a recent image of the building. Great post! I drive past the building twice a day. It is nuts. I can hear the Librarians pondering issues relating to shelf space. Too funny. It is quite an unusual structure, but I love it. Thanks for your comment Flora.